Je devrai changer de vêtements. I will have to change clothes. You will have to behave. She will have to explain everything. We will have to move out. Vous devrez porter un uniforme? You will have to wear a uniform? Ils devront faire leurs lits. They will have to make their beds. Quand ils ________, tu iras les accueillir. .When they arrive, you will go and welcome themand correct answer given was "arriveront".However, I wonder if the futur antérieur would be more appropriate? They have to arrive before you can go meet them, right?So how about:Quand ils seront arrivés, tu iras les accueillir. You are correct in that it is a classic case of two actions in the future and the preceding one using the futur antérieur. As it is from a quiz, you need to use your Report It button on your Correction Board, as it links directly to it and it is easier to have a look at your query. Could you add into the lesson itself any other verbs that share this same illegularity ? (Or if there aren’t any to say it’s unique) Thanks! 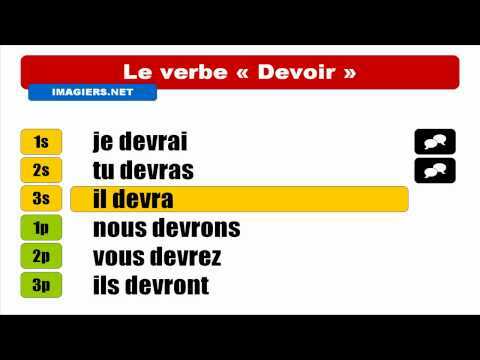 Bonjour John, Nearly all French verbs, including devoir, pouvoir, and vouloir, are conjugated in the same way in the imperfect: take the nous present tense and add the endings shown here: https://www.french-test.com/my-languages/french/view/439 So, je devais, je pouvais, je voulais, etc.